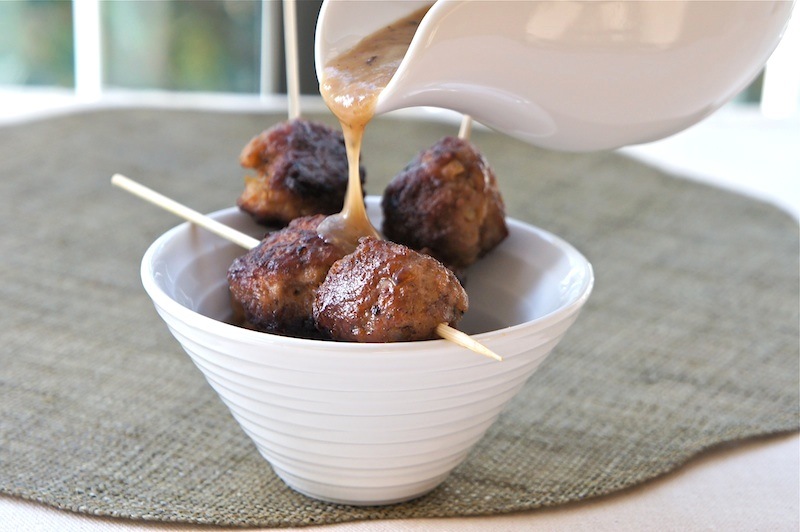 I made these Meatballs With Gravy using a combination of ground beef and chicken. It may sound complicated, but, rest assured it is a real easy recipe to bring to fruition. I then added sauté onions, breadcrumbs, eggs, and seasoned with dried oregano, parsley, paprika, sea salt, and freshly ground black pepper to the mixed meat. Shaped them, brown in a pan, and finished in the oven! That’s it. 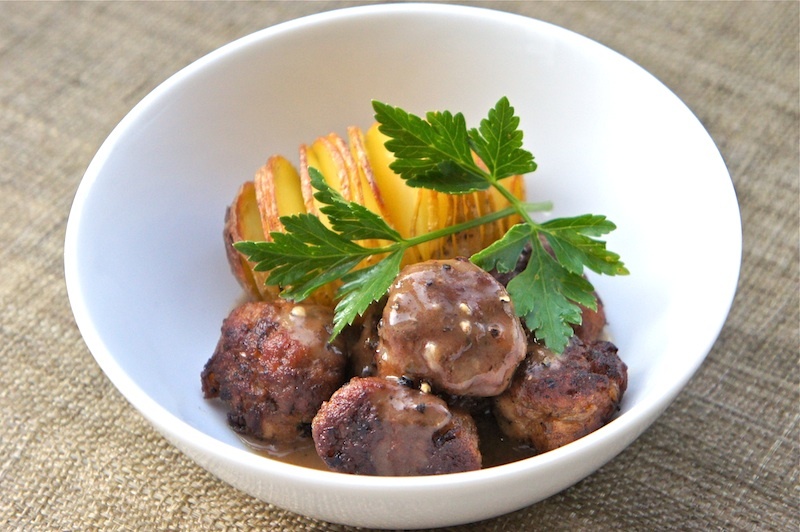 :) Here, I served the meatballs with roasted Hasselback potatoes and gravy that’s made with roux and beef stock. The meatballs were flavorful, moist, and simply divine! You can either serve the meatballs as an appetizer or as a main course. In a skillet over medium-high heat, sauté the onion and garlic with olive oil until soften, about 8 minutes. Remove the onion mixture and set aside. Put the mince in a large bowl with onion mixture, parsley, oregano, paprika, sea salt, black pepper, and the breadcrumbs mixture. Mix everything together thoroughly, kneading it with your hands as though it were bread dough. Form about 80 to 90 meatballs the size of large walnuts, rolling them between your palms so they are compact and smooth. Keep the made ones on a plate while you finish rolling the rest. Heat the butter in a non-stick frying pan and fry the meatballs in batches, making sure they are brown on all sides. You should be able to shuffle them by holding the handle of the pan and giving a good flick with your wrist. If not, use tongs to turn them. Remove with a slotted spoon and transfer the meatballs into a baking tray. Baked the meatballs in the oven for about 20 minutes, or until they are fully cooked. Meanwhile, make the gravy. Heat the butter in a large saucepan; add the butter over moderate heat. Then mix in the flour, and cook until lightly browned. Slowly add the beef stock and pepper. Cook and whisking until the gravy is thick and smooth. Season the gravy with sea salt. Serve the meatballs warm with the gravy. Makes about 90-100 walnut sized meatballs. Angie ...this is another great recipe from you. Thanks for sharing this...My piggies will love this. I have thinking what I can do with beef other than burger :) and here you have the solutions for me. Will make this for Josh. Looks fabulous. What a nice treat. 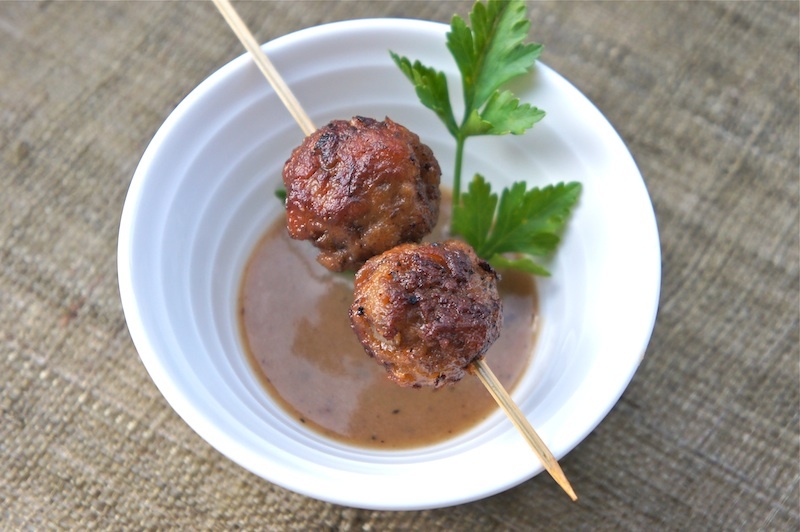 Great meatball and gravy recipes, love them both. We have meatballs one night for dinner and the next the leftovers (if there is any) go into spaghetti. Look forward to trying yours out, thanks!